It’s a very happy circumstance that there are so many fantastic apple desserts in the world. Some have become great classics and others are being dreamed up every day in professional kitchens around the globe. I think Americans are particularly fond of apples and we tend not to stray too far from the classics because they’re so ubiquitous and delicious. But, hold on! Apple of my Eye is a mouthwatering surprise created by the incomparable Elizabeth Falkner. In addition to being a celebrated pastry chef, Elizabeth is a fearless entrepreneur. She operates Citizen Cake in San Francisco as well as several other venues, including Citizen Cupcake, a Citizen Cake Kiosk in SOMA and the new Orson. I had the opportunity to intern at Citizen Cake right after finishing pastry school and it was a real treat. First of all, the pastry kitchen was huge and spotless. The worktable was in the center of the room so the staff faced one another instead of standing in a line. For a beginner, it was a good place to start. Elizabeth is a gracious person with a very creative spirit. She enjoys herself tremendously and it shows in everything she does. I must say I was not prepared for how completely delicious this dessert is. 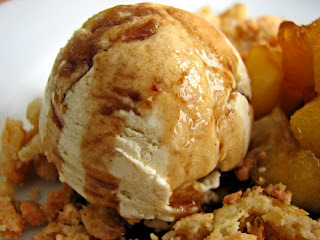 I was very intrigued when I first saw the recipe because of my love of apples, cinnamon, balsamic, cheese. All of the elements sounded good but I was very curious about how they would all work together. So I set out to find out and let me tell you, the results are utterly delectable. Elizabeth takes the best of compatible flavors and combines them seamlessly. 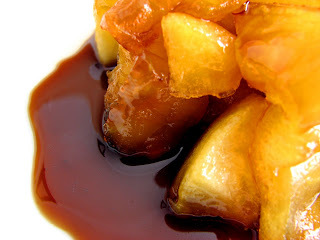 The caramelized apples have a bright freshness and a semi-soft texture. The Cheddar Crumble streusel adds not only texture but a slight salty edge. The Cinnamon Ice Cream rounds out the dessert with a creamy richness and perfect level of spice. The apple gastrique takes on the deep and dramatic hue of the balsamic and is a wondrous crowning touch, absolutely amazing. I enjoyed every note of this brilliant composition. This dessert is definitely off the beaten track. But wow, is it incredibly interesting and satisfying. Elizabeth has said she started out to do a riff on Tarte Tatin. 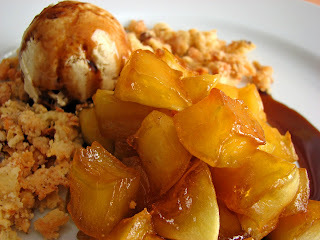 However, except for the caramelized apples, it is absolutely different. If you’re up for a new twist on traditional apple desserts, venture out and try this. You’ll be thinking about it long after that last lovin’ spoonful. - I've presented the recipe as published, but I personally would actually change the proportions of the components. I would suggest more apples, probably nearly twice the amount, which would also entail doubling the caramel. The Cheddar Crumbles recipe makes an enormous amount and I would halve that. And I would triple the recipe for the apple balsamic gastrique. It’s too delicious to use sparingly. 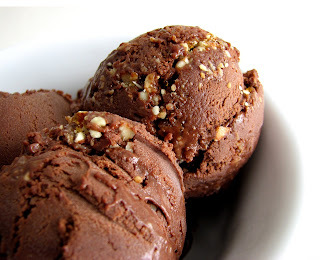 It would also taste mind-numbingly delicious on caramel ice cream or chocolate. YIKES. - You can make the ice cream a couple of days ahead. The Cheddar Crumbles will keep in an airtight container for up to 4 days. Prepare the apples just before serving. 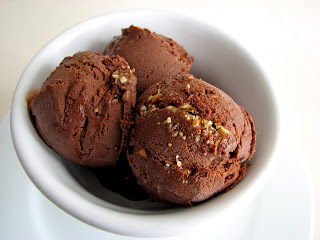 - I don’t know if there is any good commercial Cinnamon Ice Cream out there to recommend if you don’t want to make it, but it’s indispensable to this dish. Maybe you have a local purveyor who carries it. - I used a nice Bravo White Cheddar and it was perfect. Peel, core and cut the apples into 1" cubes. Combine 1/2 cup sugar, 2 tablespoons water and lemon juice in a medium skillet. Make a caramel by cooking on high heat without stirring until sugar has dissolved and begins to take on the color of dark amber, about 4 to 5 minutes. Slowly tilt the skillet back and forth or swirl gently if sugar is darkening unevenly. Remove from heat as soon as it starts to reach the right color and carefully add the apple cubes in a single layer. Return the skillet to medium heat and let the apples simmer in the caramel until they slowly begin to darken and absorb the caramel, about 5 minutes. Remove from heat and sprinkle with vanilla and salt. Let stand, without stirring or moving apples, until all the caramel has been absorbed, 10 to 15 minutes. Combine apple juice, vinegar, and 2 tablespoons sugar in a saucepan over medium heat. Bring just to a boil and reduce, turning the heat down to medium-low. Continue cooking until it thickens and is reduced by half, about 20 minutes. The mixture will continue to thicken as it cools. Warm the milk, cream and sugar with both kinds of cinnamon. Do not let the mixture boil. 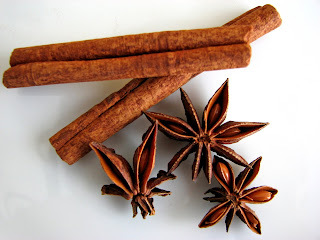 Turn off the heat and steep the spices for about 15 minutes or until you have the right flavor, tasting as you go. Whisk eggs yolks and add some of the warm milk to temper the mixture, stirring constantly. Pour into the remaining milk, whisk and return to low heat. Cook, stirring constantly, until the custard coats the back of a spoon and a finger traced through it leaves a clean track. Strain immediately into a clean container. Cool and chill thoroughly. If you want a stronger cinnamon flavor, leave the cinnamon stick in the custard. Remove cinnamon stick and freeze according to your machine’s directions. Pour into a clean container, press a piece of plastic wrap over the surface and place in your freezer to firm up. Preheat oven to 375 degrees. Line a baking sheet with parchment paper or a silpat. Mix together flour, cornstarch, confectioner's sugar, salt, pepper, and paprika. Add the butter and blend until the mixture is crumbly. Sprinkle the pecans and grated cheese over the mixture and gently toss to combine. Distribute evenly on the baking sheet and bake for about 10 minutes. 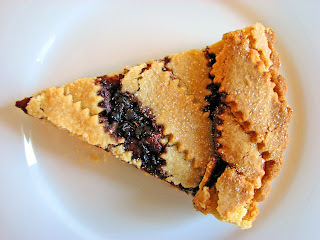 Turn crumbles with a spatula and continue baking until crumbles are golden and cheese is crisp, about 15 to 20 minutes. Let cool completely. To serve, place the apples on each place with a scoop of ice cream. Add a sprinkle of the cheddar cheese streusel to the side. 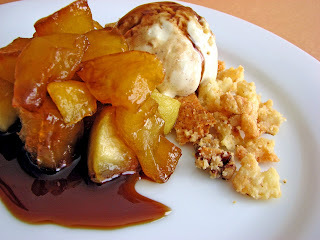 Drizzle the apple-balsamic reduction on the plate or directly over the ice cream. Serve immediately. 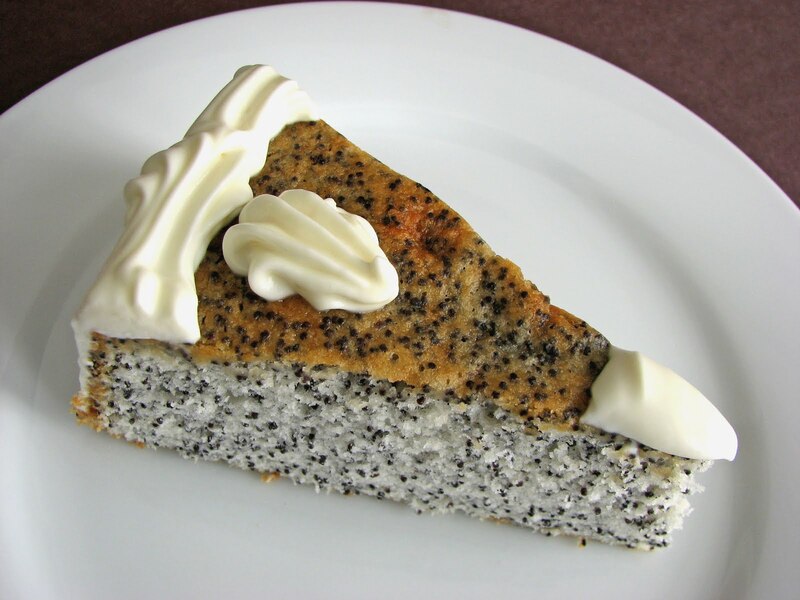 For some inexplicable reason, I haven’t worked much with poppy seeds. So when I ran across this recipe torn from a very long ago Food & Wine magazine, I thought I should break out the poppy seeds and give it a go. A quick glance at the ingredients and method seemed to reassure me that this would be a good cake. 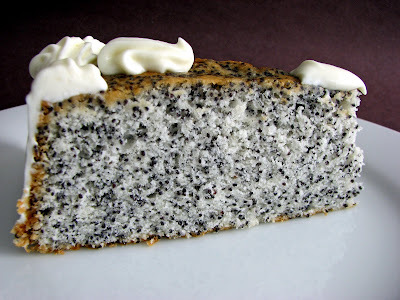 But nothing prepared me for just how nicely this poppy seed extravaganza turned out. 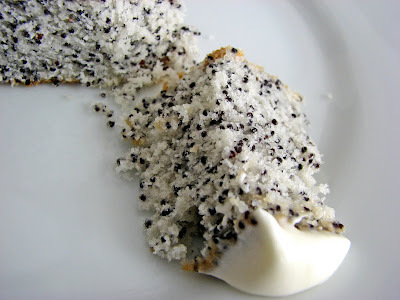 The flavor and texture of poppy seeds is hard to describe, but wow, what fun! The perfect balance of the true and trusted flavors of vanilla, butter and salt produces an unmistakably harmonic and delicious result. The cake has a tight crumb and the chewy crunchy texture of the seeds delivers all the interest to make this dessert sparkle. Egg whites enable the stark contrast of snow white cake and dark purple poppy seeds. Pretty to look at and delightful to taste, this is a great special occasion cake if you’re looking for an alternative to the usual fare. I also think it would be very good with champagne or sparkling wine. The original recipe called for a Cream Cheese Frosting, but I wanted something lighter and creamier. I think this Mascarpone Cream is really perfect. It’s a subtle and delectable complement, adding a slightly tart and creamy balance to the dense texture of the cake. Once in a while you find a recipe that is so easy to execute and so immediately delicious, you just have to bring it to the communal table. This is one of those recipes. I think you’ll find it irresistible. - Poppy seeds are expensive. Search out a bulk grocery in your area to see if they offer them. King Arthur Flour and Penzeys also carry them and offer better prices than the small jars you find in supermarkets. - Although the recipe calls for baking the cake for 50 to 55 minutes, it baked in my hot-running oven in 41 minutes. Be sure to check yours around the 40 minute mark. The cake should be nicely browned and spring back when you lightly and gently tap the top. The cake should be just beginning to pull away from the sides of the pan and an inserted toothpick should come out clean. 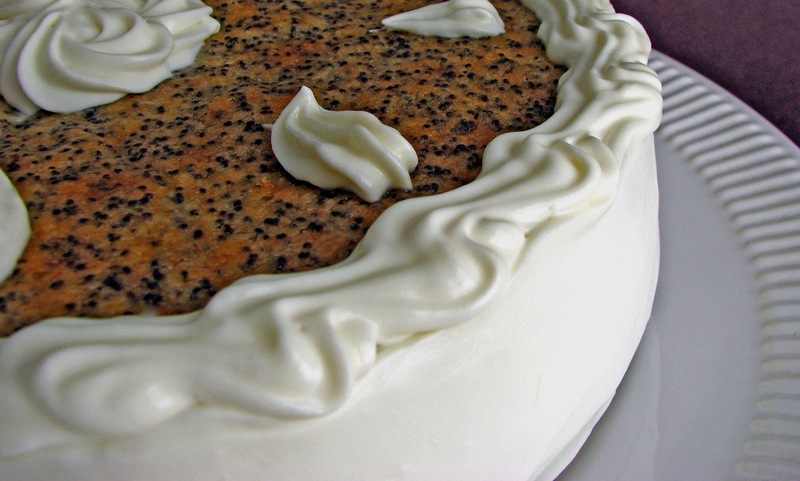 - To frost the cake, apply a crumb coat by spreading a super-thin coating of cream around the side of the cake. Refrigerate to set the crumbs. Finish the cake with the remaining cream. If you'd rather not fuss with frosting it, you can also just slather the whole cake with the cream or serve the cream as a garnish. - This cake is best enjoyed the same day. 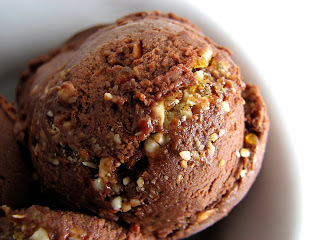 - This recipe is from an old copy of Food & Wine magazine, but I can’t find a date on the page. In a frenzy to clear out a large stash of old magazines, I clipped the recipes I wanted to save and didn’t notice that the reference to this particular issue wasn’t in tact. For the Mascarpone Cream, gently whisk the mascarpone and the sugar until combined. Add the cream and vanilla and mix until smooth and thickened a bit. Be careful not to overmix or the mascarpone will start to break down. Refrigerate until ready to use. For the cake, split the vanilla bean lengthwise. Scald the milk with the vanilla bean. Place the poppy seeds in a bowl and pour the scalded milk and vanilla bean over them. Cool to room temperature. Scrape the vanilla bean into the milk mixture. Preheat the oven to 325 degrees. Prepare a 9” x 2 1/2” round cake pan with butter, flour and parchment paper. Beat the butter until light and fluffy, about 2 minutes. Gradually add 1 C sugar and continue to beat until very light and creamy, about 5 minutes, stopping once or twice to scrape down the bowl. Add one-third of the flour mixture at a time, alternating with half of the milk-poppy seed mixture and ending with the flour mixture. Stop the mixer just before thoroughly blended and gently finish the mixing by hand, using a rubber spatula. Whip the egg whites and a tiny pinch of salt on medium speed until the whites are opaque and form soft peaks. Keep whipping as you begin to add in 1/4 C sugar, just a little bit at a time. Increase the speed to high just before adding the last couple of teaspoons of sugar. Whip until the meringue forms peaks that are stiff and shiny, about 1 minute. Fold a third of the meringue into the cake batter. Continue to incorporate the remaining meringue in two additions, gently folding until there are no white streaks. Be careful not to overmix. Scrape the batter into the prepared pan and bake for about 50 – 55 minutes or until a tester inserted into the center comes out clean (mine baked in 41 minutes, so check yours early). Cool on a rack for 10 minutes. Invert the cake from the pan and finish cooling, right-side up, on the rack. Between the hectic pace of entertaining for the holidays and the peak excitement of preparing for all the upcoming inauguration parties, it might be just the right moment for a simple and beautiful little fruit recipe that is both elegant and delicious without a lot of fuss or fret. Pears are so good and plentiful right now, I thought it would be fun to do a simple riff on a recipe from Deborah Madison, famed for her vegetarian cookbooks and her dedication to fresh local produce. If you’ve ever wished you could combine your dessert and cheese course, I highly recommend this great example of the perfect blend of fruit, nuts and cheese. The fresh fruit is delicately simmered just until tender in a delicious honey butter sauce. The caramel adds a shimmer of lusciousness that will leave you in unmistakable bliss. 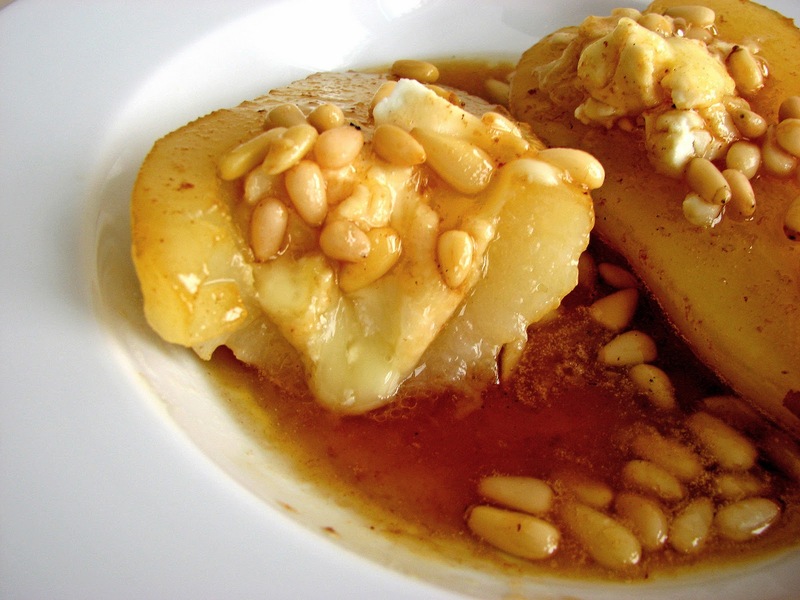 The pine nuts bring a creamy richness and nutty textural element. Perfecto. So if you’d like a little respite from the party production line, this dessert is like a soft pillow landing. I once worked for a cheesemonger and it was one of the most interesting and enriching experiences I’ve had in the culinary world. Learning in greater depth about the origin and variety of hundreds of artisan cheeses available from the far reaches of the globe proved to be a total thrill. Among the many pleasures are all the rustic but elegant ways artisan cheeses are aged and packaged. The various papers, cheesecloth, farm stamps and seals are such a rich reminder that these supreme cheeses are crafted by hand and packaged with the heritage of all the local traditions. The colors and smells and tastes run the full range of every nuance imaginable. And the process of deciding on the language to describe the complexity and uniqueness of each one, determining the delectable garnishes and accompaniments that would enhance the tasting and then selecting the soothing wine pairings is clearly never-ending. It's really just so much fun. Take a few moments to prepare and savor this divine little dessert. You’ll be sure to find yourself thinking about who might be next on your list to share and delight in this simple and sigh-inducing luxury. - Use a delicious fresh goat cheese or any favorite cheese that will melt easily. Humboldt Fog is delicious, as is Alta la tur, Robiola Bosina, Cana de Cabra, Purple Haze, Cravanzina, Valdeon, Roquefort or any creamy blue. Make it fun! - I’ve reduced the butter in the original recipe by 1 T and added a bit of acid to brighten the caramel and cut the richness of the butter. I recommend rice wine vinegar or lemon juice, adding to taste. - I used 2 pears and found that there was a good portion of sauce, but 3 pears will work, too. - This is also good with a fresh grind of pepper. 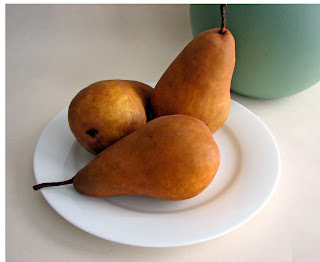 Peel pears and cut in half. Core them and rub with lemon juice. Melt butter in a skillet over medium high heat until it just begins to brown. Add pear halves cut side down and drizzle with honey. Swirl the pan gently to blend the butter and honey. Reduce heat to medium low. 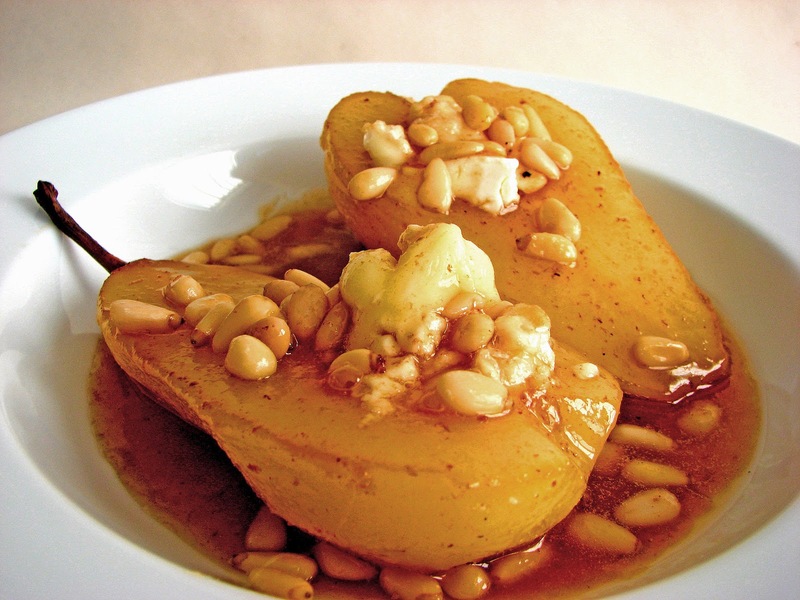 Cover and cook pears until tender when pierced with a knife. Check every few minutes to baste the pears and to be sure that the caramel is not getting too dark. 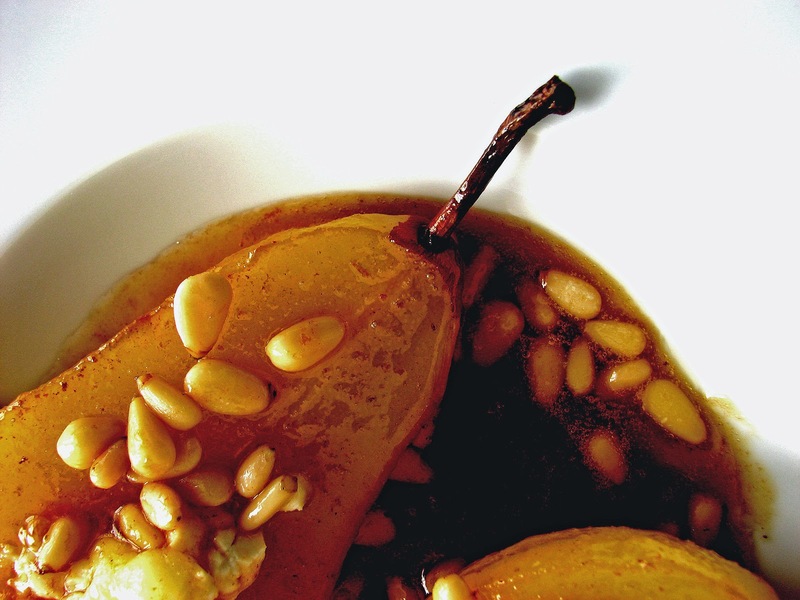 Add a bit of water if caramel sauce turns deep amber before pears are tender, about 12 minutes. Transfer the pears, cut side up, to serving plates. Top the pear cavities with crumbled cheese. Return the caramel sauce to medium-high heat. Add the pine nuts and sprinkle lightly with salt to taste. Add vinegar or lemon juice to taste. Cook until sauce is brown and bubbling, about 2 minutes. Spoon sauce over pears and serve. Cheers to January 2009! January always presents us with the myth of Janus, the Roman god of gateways, of the beginnings and endings symbolized by the thresholds in our path. We often spend this time reflecting back on what has been and also looking forward to what will be and what we will make of the opportunities ahead. It seems it’s right about this time that I begin to miss the bounty of fruit that the spring and summer provide. Despite all the fabulously beautiful desserts and pastries of fall, for me, it’s the introduction of fruit that always adds to the seduction of the pastry table. The anticipation of the quality and quantity of the coming new crops adds to the excitement of what lies in store. 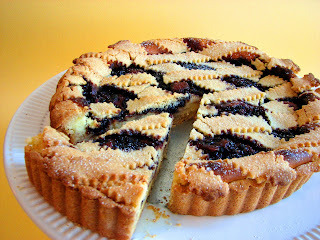 So it was a bit of a pleasure for me to dip into the jars of homemade preserves of seasons past held in my pantry for just such an occasion in order to bring a little spring reminder to this wonderful Italian Torta. I love Italian pastries for their forthright simplicity and their rustic call to earthy artisan values. This tart begins with a delicious classic Pasta Frolla crust, which crumbles with the buttery loveliness of a shortbread, only lighter. It’s filled with a very simple ricotta just slightly dressed up with lemon zest and a touch of vanilla. The gorgeous color and jammy lusciousness of fruit preserves fulfill that desire for a quick look back and a longing look forward to the grand gestures of nature. This is an exquisite taste of Italy and a preview of the excitement and satisfaction that await in our kitchen as we shift into our hopeful New Year. 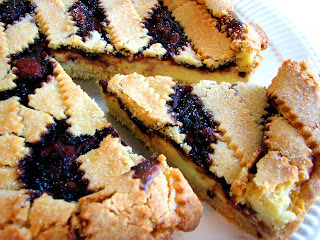 - Look for the best quality preserves with low sugar as well as good creamy ricotta. I used blackberry but other fruit would also be great, such as plum, fig or orange marmalade. Or maybe a little combination. - When rolling dough that has been chilled, let it sit for a few minutes to warm up a bit. As you begin to roll it out, if it’s cracking, it’s still too cold. Wait a couple more minutes and try again. It should still be cool but roll out smoothly without resistance. For the Pasta Frolla, place the flour, baking powder, salt, sugar and lemon zest in the bowl of a food processor. Pulse to combine ingredients. Add the cold butter pieces and pulse just until the butter is the size of small peas. Add the egg, egg yolk and vanilla and pulse just until the dough starts to clump near the center. Remove from the bowl and place on a piece of plastic wrap. Knead the dough gently just enough to pull it to together. Divide the dough into two pieces in 2/3 and 1/3 proportions. Refrigerate until thoroughly chilled. Remove the larger piece of dough and let it sit for a few minutes to warm up a bit. On a lightly floured piece of parchment or a work surface, roll out the dough to about an 1/8” thickness. Line a 9” tart pan, pressing gently into the base of the pan. Trim the excess around the edge. Chill the lined tart pan. Roll out the remaining dough to about an 1/8” thickness, using flour as necessary to prevent the dough from sticking. Cut the dough into 1” strips and chill. Preheat the oven to 350 degrees. Place the rack in the lowest third of the oven. If necessary, heat the preserves very briefly just to loosen up to a spreadable consistency. Cool. For the Ricotta Filing, place the ricotta in the bowl of a food processor and process until it becomes smooth. Add the sugar, vanilla, citrus zest and eggs and process just until combined. Pour the filling into the chilled tart. Gently spread the preserves over the ricotta filling. Take the chilled strips of dough out of the refrigerator and lift carefully, using a small spatula to loosen if necessary. 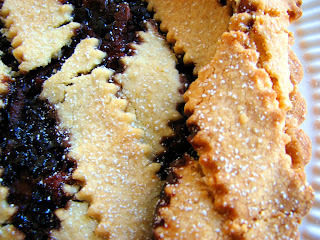 Place the strips on top of the filling in a lattice pattern. Press and firmly seal the edges. Trim any excess. Place the tart on a baking sheet and bake on the lowest shelf of the oven for about 45 minutes or until the tart is golden. Cool and serve.